The Mastodon HT tire is designed specifically for intermediate to hardpack surfaces, including rocks and shale. It boasts a smooth ride quality with its Light Truck tire influenced design. The HT is built to exceed in both high-speed desert situations as well as tight rocky trails. 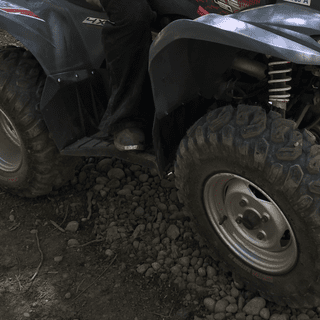 I recently installed two complete sets of these tires on almost identical ATVs. 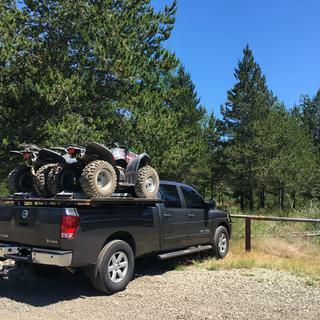 2007 Yamaha Wolverine 450 4x4s, weighing about 550# each. Previous/comparison tires were OE-supplied 23" Maxxis Lynx Radials, and 25" Kenda K299 Bearclaw bias-ply tires. The HTs that I installed are 25" tall. I'm pleasantly surprised with the all-around performance of these tires. I had concerns because there were so very few reviews of them, and most of the reviews were on SXS, not ATVs. My concerns were laid to rest early on into the first ride. Initially, it's quite noticeable that the tighter tread blocks, and smaller voids create a very smooth and quiet ride compared to my two previous tire selections. Tire vibration with the HTs was immeasurable, non-existent. Very well mannered, at both a slow crawl, and at a faster (25-55mph) speed. These ATVs aren't going to win any races, but I feel they're powerful enough to give these tires a run for their money. Surprisingly, the tires are both light enough, and grippy enough to be able to pull a mild wheelie from a standstill, something that's been all but impossible up until now. The 421cc carbureted engine, with the added weight of a front diff, and being powered VIA a stock CVT trans, means that getting the front wheels off the ground without a ramp, just didn't happen. So, it was a nice surprise that this is now possible. I'm about 250#, and ran my tires at 5.0psi, my other ATV had a 140# rider, and tires inflated to 4.0psi. OE specs call for 5.3-5.8psi, on the OE 4-ply Lynx tire. Seeing as though the sidewalls on the new HTs were a bit stiffer than stock, I opted to drop the pressure a bit. This made the tires feel very forgiving, but not sloppy or squishy in the fairly tight, 48"-wide western Washington wooded trails. Rocks and roots had very little impact on the ride comfort. The tires did a fantastic job at soaking up the bumps. It was a plush, yet very predictable ride. While at speed, we never really felt ourselves expecting a level of performance, that wasn't provided. We did notice a bit of excessive 2wd tire spin at slower speeds when traversing piles of rounded river-rock style, golf-ball sized rocks/gravel... especially while going uphill. But, that's to be expected with a closed tread pattern such at the HT. Also, when attempting to turn around on the narrow trails, 4x4 was almost a requirement to get the rear tires to bite laterally while trying to reverse up onto the edge of the trails. Once in 4wd, the front was pulled around and the rear pushed up onto the trail edge pretty effortlessly. 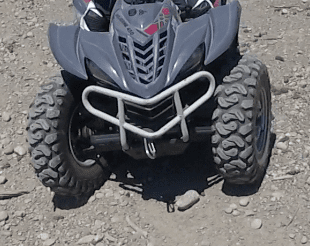 But, from a standstill, in 2wd, with the handlebars turned, the ATV just traveled in a straight line rearward, dragging the front tires, while the rears chewed away at the trail's edge. Again, I attribute this to the closed tread pattern. On dirt, in 2wd, at 6-10mph, we were able to achieve parts of the trails that had previously only been achievable (on these machines) in 4wd. That was a pleasant confidence booster. So, with a little bit of speed/momentum, the closed tread pattern performed better than both previous open tread pattern tires. In general, in both 2wd & 4wd, at both slow and fast speeds, these tires required much less effort to steer & control. Significantly less rider fatigue than with our previous tire selections. Additionally, in 4wd, the ATVs felt unstoppable. Confidence in the tires was very high. Any perceived traction deficit in 2wd, was over-shadowed by the performance and traction that the tires offered in 4wd. A bit of speed is key to this tire's success. 4wd can overcome any low-speed traction deficit though. If you prefer a smoother ride, and have 4wd, or are only going to run these on the front, the sacrifice made as a result of the closed tread pattern is totally worth it. Why don't they come in a 27 ? BEST ANSWER: Looking at Kenda's website it looks like they didn't make these tires in 27. We apologize for the inconvenience. 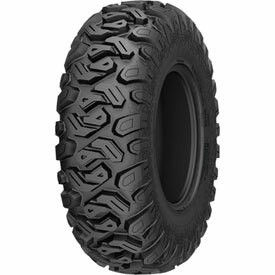 In your description you point out that this tire is a side by side UTV tire, is this tire appropriate to use it on my Honda Rubicon ATV ? BEST ANSWER: Yes, you could still use this tire on an ATV. Tyson, Thank you for your elaborate and detailed reply.